Doberman Security Credit Card Reminder | OhGizmo! 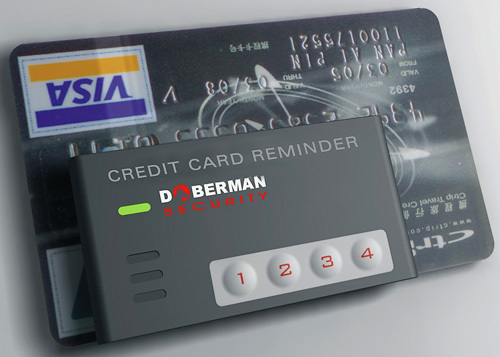 At first glance you might think the Doberman Credit Card Reminder was a handy tool for remembering to grab your plastic after making a purchase, but unfortunately that’s not the case. It’s actually designed to remind those big spenders who are picking up a large bar or meal tab to retrieve their card at the end of the night. It has 4 simple buttons that are used to set a timer for 1-4 hours. When the clock runs out an audible alarm and blinking LED will go off, reminding you to reclaim your card. While the Doberman is attached, the card can still be swiped but it looks to me like it would be pretty easy to remove, and really not that secure at all. You can find the Doberman Card Reminder on Amazon for just $7.99. I agree that it is not so secure. It would be better off to use something like prepaid secured credit card, althought it may be weird for someone with good credit score to use the card, so finally we are back to the old fashioned way.. Self DISCIPLINE.. Cheers! nice article. i personally liked this article .this system help in security of our credit card. i liked this article, credit card should be secured atlest some thing has came to secure our credit card .